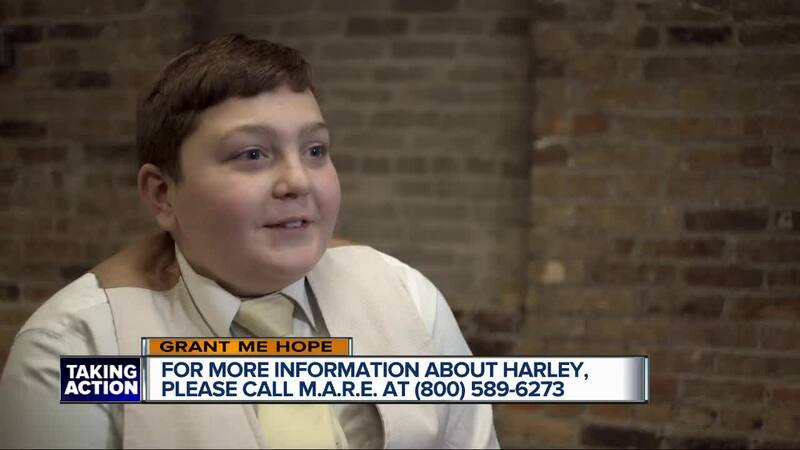 13-year-old Harley is a foster child in Michigan who is hoping to be adopted. DETROIT (WXYZ) — “My favorite sport is basketball because it’s a good workout and I’m good at it,” said Harley – a 13-year-old child who is currently in foster care in Michigan. He’s hoping to be adopted by a family who would like to go to some of his games or play board games with him. “I like to spend quality time and go to football games, play sports with them,” he said softly. His second favorite sport is football. Harley described himself as artistic, funny, and good to hang around with. “With my friends, I like to play video games,” he said. Fortnite is one of his favorites. “My favorite subject in school is math, but I also like science. Why I like math is because I’m good at it and I understand it the most. Science -- you can do fun stuff with it,” said Harley. “When I get older, I either want to be an engineer or play in the NBA,” he explained. His favorite foods include ribs, pizza, and a lot of salads. “I envision myself living in Hawaii. It looks fun. There’s a lot of water. I’d swim and stuff,” he said wistfully. But what he really wants is to be adopted before he turns 18. “I’m very caring. I just hope y’all are looking for a kid that’s like me,” he said. If you’d like to learn more about Harley, click here. If you’d like to talk with an Adoption Navigator about adopting Harley, please call the Michigan Adoption Resource Exchange at (800)589-6273. You can also help by sharing this Grant Me Hope video on social media. Thank you!